Hold My Heart Bouquet is a bold statement of love's connection to delight your sweetheart this coming Valentine's Day. 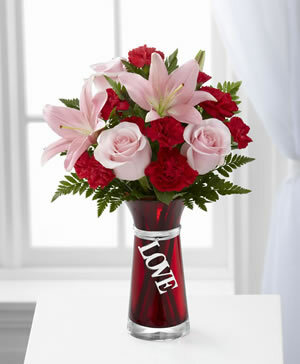 Unforgettable pink roses and pink Asiatic Lilies are offset by the rich reds of carnations and mini carnations perfectly accented with lush greens to create an exceptional fresh flower arrangement. Presented in a designer red glass vase with a large silver toned charm dangling from the neck, declaring "Love", this mixed flower bouquet will be a wonderful way to express your undying love and affection and add a touch of romance to their February 14th.